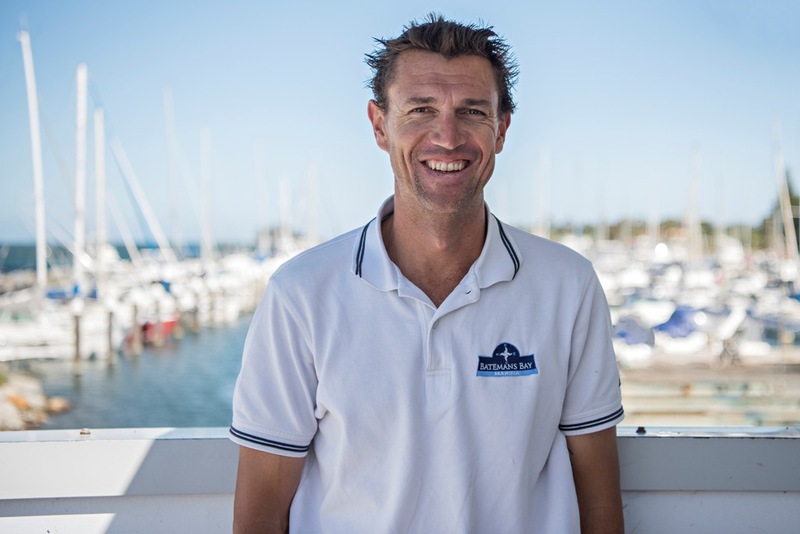 Batemans Bay Marina Manager Daimon Martin has been selected as a finalist in the People’s Choice Award for Best Marina Employee in the Marina Industries Association (MIA) Club Marine Marina Awards (a worthy choice, we all agree). In the role just over a year, he has made a tremendously positive impact on the marina and the south coast boating community—but he wasn’t always in management. Daimon started his working life at Akuna Bay Marina on the Hawkesbury River 15 years ago, learning the shipwright trade by helping to build super maxis for the Sydney to Hobart with McConaghy Boats. He had grown up near the water on Sydney’s Northern Beaches—fishing, camping and surfing—and ocean life was in his blood. Working in the trade for several years he then opted for a career change and began studying aeronautical engineering, moving to Tamworth in regional New South Wales. But the ocean called him back, and he settled in Batemans Bay with his young family a few years ago, taking up a position at the old marina’s slipway and hardstand (many would remember him from that time). When Sydney-based investors took over the 70-year lease in April 2016, Daimon was invited to be part of the new management team. While most of his skills have been honed on-the-job, he has also benefited from an MIA Marina Management Course. But his real worth is not just his knowledge of boats or the ocean or his management skills, it is his passion—for the marina and the boating community. Treating everyone with the utmost respect, giving his time to each individual as though he had the capacity to extend the hours in the day, taking care of the smallest things and going the extra mile—these are just some of his attributes that have made him a crowd favourite. For the marina and the tenants, Daimon has made strong connections with the local tourism sector, and he is always looking for new opportunities to benefit marina clientele. “The world is moving fast and people are looking for moments in time they can enjoy, experiences that will help them stop a while and make memories,” he said. The winner of the People’s Choice Best Marina Employee and the other award categories will be announced at the Marine17 conference in Sydney. (Whatever happens, Daimon is a winner to all of us!) For more information about the awards and the finalists read this article in Marine Business. • Daily collection and return of electronic key fobs is now in place and is standard policy for contractors working on site. • Please inform your contractors they must sign in and out at the marina office and present their current BIA workplace induction card and certificates of insurances. • The old marina gate keys are now redundant for access to the wet berth area however they will need to be retained for access to fuel bowsers and amenities after hours. • Please remember to keep gates closed! The onus is on individuals to help maintain a secure berth area. 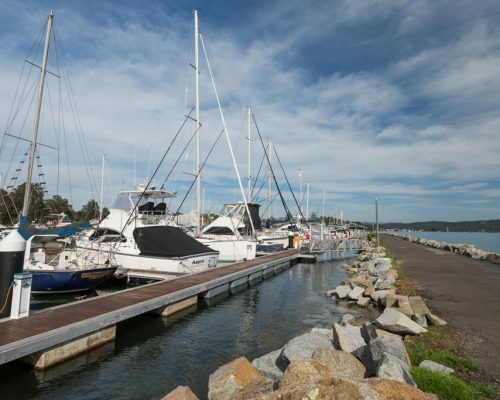 Batemans Bay Marina has added vessel management and detailing to its suite of services. 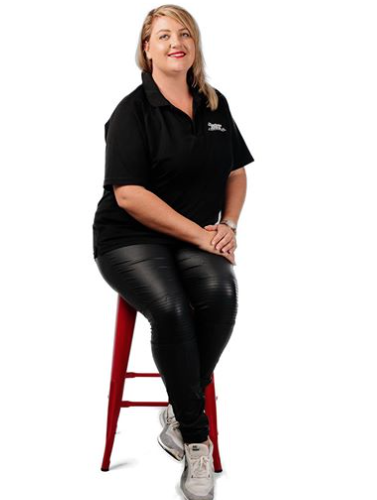 Their newest Crew Member Claire Rinaldi comes from an experienced on-water detailing team in Sydney. Claire brings a wealth of knowledge and has a lovely personality and an eye for detail. See the staff for further information and join the other vessels they now care for on a programmed detailing roster. The marina has also been busy working with a local wholesaler and UK-based manufacturer to produce a range of marina-specific fenders. On display and for order at the marina office, they include bow and stern fenders and step fenders, which allow for embarking and disembarking vessels amidships and provide a step up at the topsides. 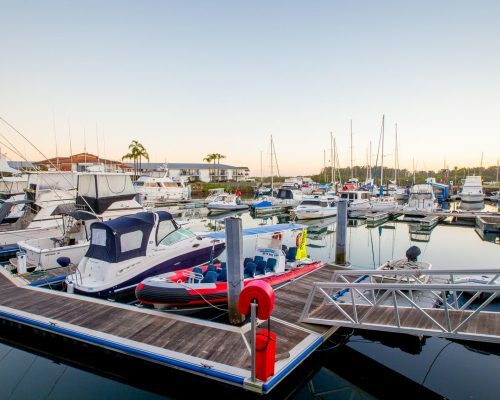 With the extreme weather systems across Queensland and parts of northern New South Wales, boat owners at Port Macquarie Marina breathed a sigh of relief when Cyclone Debbie fizzled out into heavy rain. The new pontoons also helped guarantee a safe harbour. There has been a significant increase in visiting boats, which has benefited tenants and businesses and increased use of fuel facilities. The hardstand area managed by Peter Lord of HCM Marine has been busy with more than 200 vessels taken out of the water since it began operating, while Terry Nocelli from Shotgun Marine has reported a good increase in electrical services and sales, some attributed to vessels from the Gold Coast and possibly due to the impact of Cyclone Debbie. Other tenants Graham Seers Cyclery and Second Nature Boutique have also reported increases in sales, while Quay Lime Bar + Grill has had its decking completed to give guests the ultimate outdoor dining experience (with an abundance of glorious weather lately, it’s perfect timing). 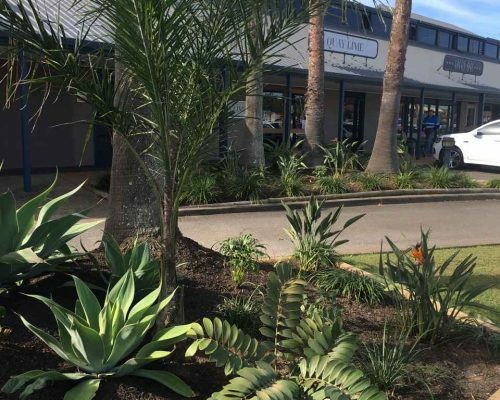 Across the road the new K Mart Marina Shopping Centre, which opened in April, is playing a role in channeling new customers across to the marina’s retail precinct, and will give marina transients another option for stocking up supplies when stopping by. 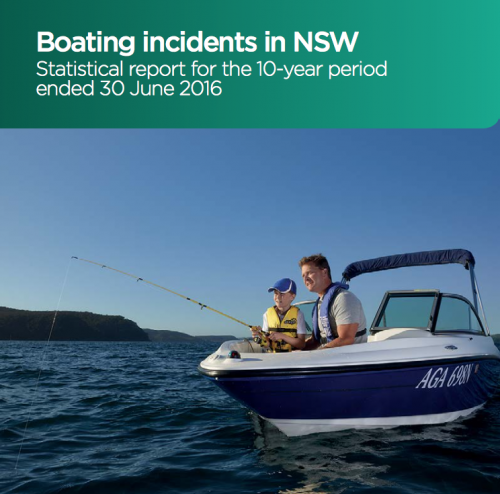 Boating is getting safer in New South Wales, according to the Boating Incidents in NSW report for the 10-year period ending 30 June 2016. With just 11 fatalities from recreational and commercial boating incidents during the period 2015-2016 (compared with a long-term annual average of 17), they are in decline. Serious injuries related to boating incidents also fell (56 in 2015-2016 compared to the long-term average of 68) along with the total number of incidents for both recreational and commercial vessels (257 in 2015-2016 compared to the 10-year average of 344). The most common causes of recreational boating accidents resulting in fatality over the past 10 years were capsizing, falling overboard and injury while towing (such as water skiing). To find out more, download the report. The Federal Government is now the single national regulator for domestic commercial vessel safety. The National Law—as it is called—replaces eight federal, state and territory laws with a single law for the safety of all commercial vessels and their crew in Australian waters. This represents tens of thousands of boats and can be anything from the caravan park milk bar renting out kayaks to commercial fishing trawlers and tourist boats. However, according to Maritime Industry Australia (MIA) the changes need to be matched with appropriate funding to keep the industry afloat. Read more in the MIA media release. The problems with ethanol-gasoline blends such as E10 (perfect for cars, not boats) are well known. For the past five years isobutanol has been scientifically tested as a potential substitute for ethanol to reduce exhaust emissions. It is distilled from the same plant as ethanol but does not attract water or corrode fuel lines and boasts 30 percent higher energy density, compared with ethanol. To find out how B12.5 isobutanol blend performed against E10 in on-water testing, click here. Port Macquarie-Hastings Council continues to attract tourists as well as enhance living in the region, with implementation of its Port Macquarie-Hastings Cultural Plan 2016-2019. The plan aims to ensure that arts, heritage and culture play a strong role in the region, by reinvigorating existing activities and developing new and innovative opportunities. 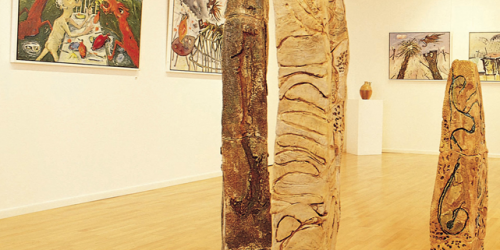 Projects to date have included a sculpture at Gaol Point Hill, free concerts and artists-in-residence programs. A newly established Cultural Steering Group will oversee a cultural plan review and set future priorities. To find out more about arts and culture in the region visit the Arts and Culture page on the council’s website or download the Cultural Plan. Hugh Brown used to have a day job. A retired foreign diplomat, the 62 year-old now splits his time between his 200-acre Bungendore property with his family and sailing the ocean. “It’s utter idleness, self-indulgence and pleasure,” he says of his fortunate lifestyle. Hugh’s father was in the navy and as a child they would sail dinghies together with his brother, progressing to keel boats in his teens. After a 30-year hiatus from the water, Hugh’s interest was rekindled when he met Brisbane-based sailors with an intriguing nomadic existence, and he bought his first boat. 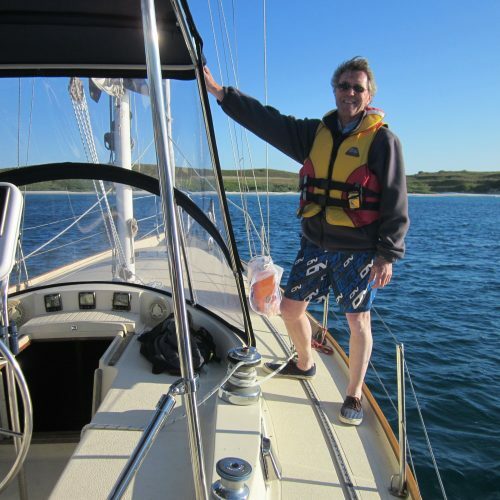 Moving from Brisbane to Canberra 20 years ago, he sailed his Citation 34 Longway from Mooloolaba to Batemans Bay, which inspired his love of blue water sailing—despite high seas, sea sickness and a few minor catastrophes along the way (it’s a fabulous story, read Hugh’s account Taking the Longway home). Since then he has bought bigger and more comfortable boats, living the gentleman’s life and occasionally luring his family to the water. “My wife doesn’t have the same level of interest, my 17 year-old daughter prefers shopping and my seven-year old son is busy with sports, but for me there is never enough time for sailing,” he said. Hugh had been planning to visit Airlie Beach and sail his Endurance 35 Empede earlier this year, but then he saw a photo of the boat on her side high and dry on the beach set against a back drop of palm trees—an iconic image of the devastation caused by Cyclone Debbie. Luckily insurance meant he will be able to replace her, and in the end he took a sailing trip around Sydney Harbour and up to Newcastle with some pals instead. Meanwhile he still has his Tophat 25 Cintra at Batemans Bay and is busy planning his next adventure—perhaps a leisurely trip around Australia. You can read more about Hugh’s sailing exploits—including a series of posts about sailing misadventures on a trip from the Philippines to Thailand—at www.sailingmisadventures.com. Rebecca Rowsthorne was going to buy acreage in the Port Macquarie region but when she saw The Cruise Terminal was for sale, she bought that instead. Moving herself and her three children from fast-paced Sydney, where she had worked in marketing and as a chef, the family has reveled in Port Macquarie’s laid back lifestyle and close-knit community. “I didn’t know anything about boats. I just knew I loved the area and I wanted a sea change for my family,” she said. “Running the business has been amazing, I’ve learnt a lot and I’ve had great support from Bill at the Marina and the services they provide, the staff at HCM Marine as well as Mark from Port Marine Brokers. Taking on management of the 110-capacity Port Venture River Princess and an authentic Chinese junk (Port Macquarie’s most iconic vessel), in the two years since owning the business Rebecca has added the boat Ocean Adventure 1, which seats up to 12 people for whale watching and dolphin watching, as well as kayaks and stand up paddle boards (SUPs). Developing the business has paid off, with some weeks completely booked out and five whale watching trips a day from May through to October—the slow season for river cruises. Her children—now 13, 11 and 6—help out as much as they can, and her mum recently moved to the area as well. ‘It’s definitely become a family business. It can take up a lot of my time so it’s great that the children can be involved. 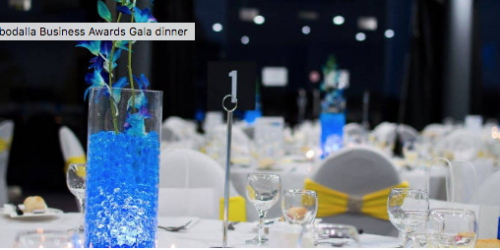 The Cruise Terminal offers tours on the Port Venture River Princess and the Chinese junk, or you can hire them for a special occasion (following in the footsteps of famous chefs Matt Golinksi and Matt Moran). There is also seasonal whale watching and dolphin spotting and year-round kayak and SUP hire. Batemans Bay Annual Yellowfin Competition: One of the biggest events on the game fishing calendar. Moruya Golf Club 2017 Winter Classic: 140 places available, two-person ambrose played over two days. 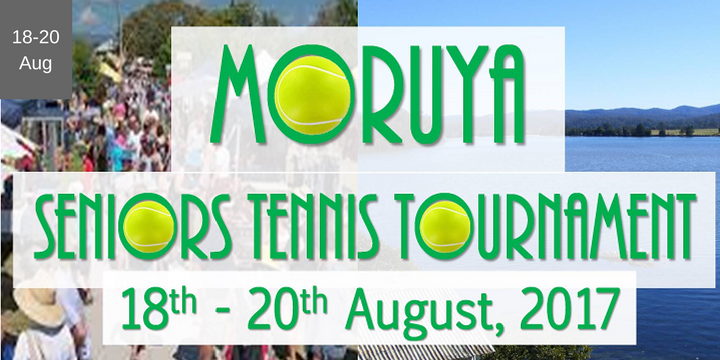 Moruya Country Market Seniors Tennis Tournament: For amateur players aged over 35, round-robin format to get everyone playing. The Foreshore Market: Find unique handmade arts and crafts and a community spirit on Park Street, Port Macquarie. Timbertown Annual Steam Fair: Steam boats and steam vehicles including trains and traction engines, demonstrations and more. Mid North Coast Caravan, Camping, 4WD, Fish and Boat Show: More than 165 exhibitors, 4WD display, camp oven cooking, reptile show, bike show and more.